Winter is finally letting up a little bit, and it’s almost time to start looking forward to the warmer days of spring. After a particularly cold winter, everyone is thinking of all the cleaning that needs to be done around the house—but there’s one place that you shouldn’t forget: your car. The main reason for this is because cold weather is especially hard on our vehicles. Maintenance after the kind of weather we’ve had lately is of paramount importance. There’s also another benefit to a good spring cleaning: you have the chance to make your car’s environment healthier for yourself. Let’s be honest here—as much as we like to think that the interiors of our cars are germ and dirt-free zones, that’s 100% not the case. Even the most vigilant car owners will have friends and family who will track debris and bugs into the car at some point. While you may keep the dashboard and upholstery as clean as possible, anywhere someone sits is a place where dust, oils, and dander are going to be found. A regular cleaning is something that absolutely needs to be done. So, today we’ll be talking about what, exactly, you need to be doing for your car’s spring cleaning. If you’ve been using winter tires, remember to change them out. The lower temperatures can also cause your winter tires to soften too much, making you have to buy new ones sooner. Aside from that, winter can also degrade the roads and cause cracks and potholes—both of which are bad for your tires. Check that the tread isn’t too worn down and that the tires are still usable. If you’ve switched back to your non-winter tires, take this chance to check the tire pressure as well. You probably haven’t had time to give your car a solid wash over the winter (especially if all it would result in is ice all over your vehicle), so now’s the time to do it. Any dirt, salts, and mud that’s built up on your car over the past couple of months should come off now. Rust and corrosion will build up more the longer you leave the dirt on there. Check under the bottom of the car and around the wheels as well, as the snow and dirt will have accumulated there the most—and they’re also the least-noticed parts of the car. The interior should also get a good once-over! Sanitizing all the hard surfaces and vacuuming the upholstery to get any dirt and dander out is a good start, though it depends on how clean you keep your car on a regular basis. The floor should get special attention, as people have probably tracked in all sorts of snow and slush and mud in throughout the winter. Not for you, for your car! 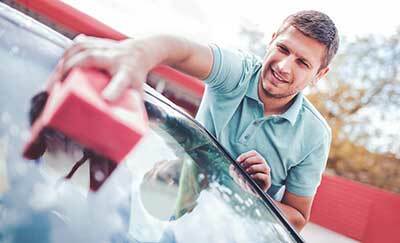 It’s a great time to wax your car—a good wax and you can protect your car’s paint job through the hotter months, all the way until fall. It’ll keep your paint from fading during summer, and keep water off your car during the spring rains. We think you need to wax your car at a minimum of two times a year, even if all you’re trying to do is protect your car’s paint. You’ve probably had your wipers beating for the entirety of winter whenever you take the car out. Snow and ice are harder to get rid of than water, so it’s possible that your windshield wiper blades are worn out. It’s best to go ahead and place them so that when the spring and summer rains come they’ll still be effective. All in all, these are just the basic things that should be done. At the end of the day keeping your car clean and well-maintained can only be good for your peace of mind and safety. Doing this basic maintenance earlier is always better than later! If there’s any other repairs that you need help with, we’re able to do pretty much anything you’d need to fix on a car. Give us a call at 313-534-8090 (Redford) or 734-744-8557 (Livonia), or feel free to request for a quote here.